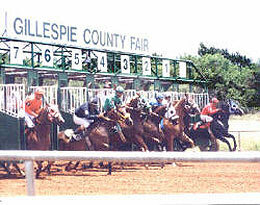 Gillespie County Fairground hosted the 20,800 Simulcast Services Quarter Horse Stakes on Saturday's race card. FREDRICKSBURG, TX�AUGUST 24, 2013�Jacob Renteria and Francisco Marquez, III's Rock That Wagon got his first black-type win Saturday afternoon in the $20,800 Simulcast Services Quarter Horse Stakes at the Gillespie County Fairground. Under jockey Joel Aranda, the 5-year-old put in late effort to defeat Newarcos Cartel by half-a-length. Good Luvin finished a nose back in the third. Bred in Texas by Bob and Jerry Gaston, Rock That Wagon completed the 330 yards in :16.744 seconds, a 97 speed index. The $12,480 winner's purse swelled the PYC PAINT YOUR WAGON gelding's earnings to more than $82,000. Candelario Montes, Jr. conditions the brown gelding out of First Tea Rose, by First Down Dash. Graded stakes-placed Newarcos Cartel earned $4,160 for his effort. Owned-and-trained by Cleto Martinez, Jr., the 3-year-old ridden by Jose Roman has earned $57,630. He was is bred by Jorge Haddad. Yasmine Fierro saddled Good Luvin, a 7-year-old mare for Eleazar Martinez, Sr. Bred in Texas by Michael Pohl, the $57,373 earner was ridden by Luis Ramirez. One Fast Wagon, Rc Had To Be My Day, Jess Fly With Me, Dw Runaway B, Making Deals, Fast Dashin Dude and Teller Ima Rockstar completed the field.